Hey everyone!! 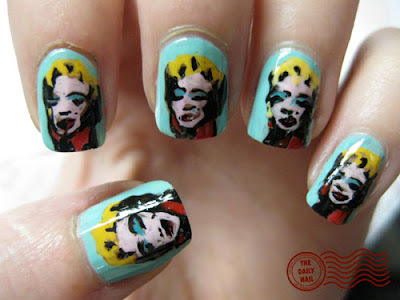 Today's nail design is one I've wanted to do for ages, it was inspired by Andy Warhol's Marilyn, c.1967 (On Blue Ground). It's not perfect, but I think I did alright, given the size, and time I had. :) A few of them look a tad 'challenged' but what can ya do, I was already up til 1 am doing them! I hope you all like them!! I used Orly Gumdrop for the background, a mix of American Apparel Manila and American Apparel Cotton for the hair, China Glaze Flyin' High for the eyeshadow, China Glaze Salsa for the lips and shirt, as well as mixed with American Apparel Cotton for the face. For the lines/shading, I used American Apparel Hassid. Topped everything off with 2 coats of Seche Vite top coat. thats cool! i've seen pics of things like that but what do you call that type of art? i'm not talking about nail art. but, great job on the nails! Anonymous - I think it's called Pop Art, I remember doing it a couple of years back in school, lol. Great job by the way! I'm always amazed at what you can do on such a small surface! Wow! u did a great job! Those nails will stop traffic. You are an artist. I've seen Andy Warhol on bags, plates, mugs, and shirts. On nails? This is a first! Wow... that's all I've got here... WOW! awesome! I think the thumb came out best. I'm not sure, but I think anonymous1 was wondering what Warhol's medium was? The original art was a silkscreen. Your talent simply amazes me! This is incredible! One of the best you've done. oh my god you did such a good job! i love these! OMG I want those nails that is utterly amazing!!! wow this Marilin Monroe pattern it's incredible, I want to paint my nails this way please post a tutorial!